Homemade spiced ketchup recipe - no onions. Plus video recipe. 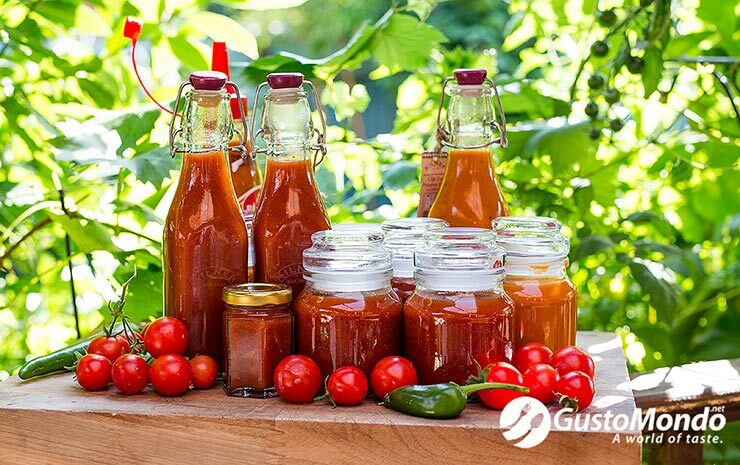 Homemade spiced ketchup recipe – no onions. Plus video recipe. As I had a plethora of tomatoes this year, from just 5 plants, I really had to improvise and innovate with tomato recipes. This is how I came up with this homemade spiced ketchup recipe, the spiced tomato sauce that I published earlier, and another sauce soon to come. I’ve “tested” this recipe on a lot of people. Adults and children as well. It’s received all positive feedback from everyone, and as we know, children don’t lie. Scale the ingredients below in accordance to the quantity of tomatoes used. The best are over-ripen tomatoes, soft and sweet. And you could get them at a cheaper price too. It is important to adjust this recipe to your taste. I’d think its best to start with only half the salt, vinegar and sugar here. All tomatoes are different. Some are sweeter, some are more acidic. Some varieties are meaty, others are juicy. Again, the same with the chili. I used chili flakes, but fresh chilies are also ok. Taste constantly and adjust the taste to the way you like it, add more ore less chili, salt, vinegar and sugar. Once more, the boiling time of the ketchup will be different all the time. Even by a few minutes. Like I said, different tomatoes have different water content. And I need to mention that the sauce will thicken slightly after it cools down. Keep that in mind. Blend it quite well at the end, and make sure you use a fine sieve and you’ll get the smooth texture that you get in a shop bought bottle. Keep it in the fridge in clean (sterilised/sanitised) bottles or containers. It won’t keep long…well it will keep ok for a couple of months at least, but I doubt that it will last that long. « Puff pastry palmiers with sage and anchovies. Video recipe.